Urban Muser: Photo Project Overload? I Hope Not. Photo Project Overload? I Hope Not. In the past week, I've decided to play in several photo-posting initiatives hosted by other bloggers. Originally, I was just going to participate in "The Sunday Creative", but then I got inspired by other blogs to join in some more of the fun. Hopefully I will be able to keep up. This coming weekend, I will post my first "Shadow Shot Sunday" (I just missed the close of the linky last week) and I also plan to participate in the "One Word Project" over at Shutter Sisters. So here is my first one--it is a photo of my Dad throwing a crab trap into the Barnegat Bay in NJ as the early evening sun sets on the horizon beyond him. I love the photo because it is so peaceful, and it captures the youthful, outdoorsy/fisherman side of him. I have wonderful memories of my Dad teaching me how to fish and crab during our summers on the bay when I was a little girl. The photo reminds me that my Dad, who just turned 70, is still active and happy and engaged in life. I am thankful for the time I got to spend with him on a short vacation last week. Yea Dad! 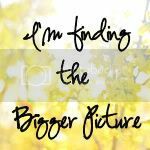 Each week, Bigger Picture Moments is hosted on a different blog. This week it is being hosted by Corinne, so head on over there if you want to play! Oh I love how you interpreted the moment! You did a splendid job :) And am so happy you're playing along, thank you! What a beautiful beautiful picture! There's nothing more beautiful than the sun sparkling on the water at dusk. Pure heaven. It's a gorgeous photo. Love the silhouette of your dad. What a lovely place to visit! Scanning down your posts was a visual treat. Great photos, and I'm particularly inspired by your market bag. I'm just learning to knit and I *love* that project. Wow! Breathtaking. I love that you have a great story to go with this too, which makes it even more beautiful. Glad to find you through Bigger Picture Moments. Your picture is gorgeous! And your intrepretation is perfect. I love seeing what everyone comes up with for these moments. Found you through BF...that picture is amazing! I love the colors in it, and such a beautiful moment to capture. What a lovely story and blog entry. Love this picture! It really takes you into that moment!